'#1: Between January of 2004 and 2008, the median household lost $4,019 in annual income. #2: Median household income fell every year of the Bush Administration. #3: Bush added nearly $5 TRILLION to the national debt in his second term. 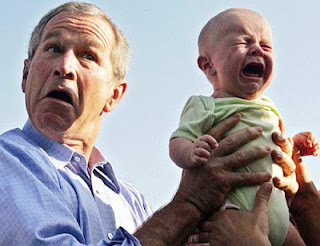 #4: Bush added more than $1 TRILLION to the national debt every year of the second term of his Presidency. #5: The federal government borrowed 44 cents of every dollar it spent while Bush was President for the last 4 straight years of his Presidency. #6: A gallon of regular gas cost $1.86 on average across America on President Bush’s first day in office. It cost $3.86/gallon on average on the day he left office on January 20, 2009. #7: The official unemployment rate was 5% in 2004 when W won his second term based on such good economic news in his previous 4 years. #8: It was 8.2% when Bush left office in 2009. #9: Unemployment rate was over 8% for 43 straight months of the second Bush Administration. #10: The true unemployment rate was 11.2% under Bush if you use the size of the labor force as in stood in January 2005 when he was sworn in for his second term after 4 good years of economic growth. #11: If you use the labor participation rate (LPR) at the 3-year average of 65.8 percent, the unemployment rate was actually 11.7 percent under Dubya's second term. Millions of people left the labor market because they were too discouraged to look for work in his terrible economy, so the official unemployment rate under Bush was artificially low. #12: LPR for men fell to 69.9 percent. This was the lowest level for male participation in the American workforce since the government started tracking this number in 1948. #13: How did the US do compared to two years previous to 2008? The percentage of working age Americans that were employed in 2008 was smaller then than it was in 2006. In August 2006, 58.5 percent of working-age Americans had jobs. In August 2008, 58.3 percent of working-age Americans had jobs. #14: Since George W. Bush won the White House for the second time in 2004, the number of long-term unemployed Americans rose from 2.7 million to 5.2 million. #15: In 2008, more than half of all Americans were at least partially financially dependent on the government. #16: The U6 unemployment rate stood at 14.7% in 2008 when you count part-time workers who would like full-time work and when you count those who have not looked for work in four weeks or more but who want work. Many economists say this was the true unemployment rate under W.
#17 The percentage of working-age Americans with a job was below 59 percent for 35 months in a row. #19: More than 104 million Americans were enrolled in at least one welfare program run by the federal government. There were 88 means-tested federal welfare programs in existence under W..
#20: The number of Americans on food stamps grew from 31.9 million when George W. Bush was re-elected to the White House in 2004 to 46.7 million in 2008. #21: One quarter of all U.S. children were enrolled in the food stamp program in 2008. #22: Since Bush won his second term as president in 2004, the number of Americans living in poverty rose by 6.4 million in his last 4 years in office. #23: While Bush was been president, U.S. home values fell by 11 percent. #24: More than 10 million homeowners were underwater on their mortgages. #26: When Bush was President, the velocity of money (one of the best measures of the economy’s overall health) plunged to a post-World War II low. #27: More than three times as many new homes were sold in the United States in 2004 as were sold in 2008 under Bush's second term as President. #28: The United States was ranked #1 in the world in Gross Domestic Product (GDP) per capita before Bush's second term started. By 2008, the US slipped to #11 — behind countries such as Brunei and Norway, according to the World Fact Book published by the CIA. #29: The United States ranked #1 in terms of economic competitiveness when George Bush was elected President for the second time. By 2008, the U.S. economy had fallen to 7th place, according to a report by the World Economic Forum — behind countries such as Sweden, the Netherlands, and Finland. #30: More than 10 million U.S. households in 2008 did not have a bank account. That number increased by one million under George W. Bush. #31: In 1999, 64.1 percent of all Americans were covered by employment-based health insurance. By the end of W's second term in the White House, only 55.1 percent were covered by employment-based health insurance. You will notice we use a lot of parentheses in these postings to connote a sense of 'humor', 'sarcasm' and 'falsehoods' at times. Sometimes we use the ' just to make sure you are paying attention. If you found yourself nodding in agreement as you read the 33 points above about the 'abysmal' Bush record as president, then you might want to consider just how objective you are in your political philosophy and general outlook on life. Because these 'facts' noted above are exactly what has happened under President Barack Obama during his first four years as President, not Dubya's. We have just changed the names and the tenses of the words to make it look and sound like 'it really was all W's fault!' that Obama inherited a terrible economy and all of the other blame he has sought to cast on his predecessor for the past 4 years. Well, you know, President George Bush was dealt a low blow just 8 months into his Presidency on 9/11, remember? Things were going pretty well since that the economy was coming out of a mild recession at the end of the Clinton Administration (we are gonna have recessions and booms in America as long as we have a capitalist system you know) and then all hell broke loose when those planes hit the Twin Towers in NY and the Pentagon in Northern Virginia. Did he spend 4 years blaming Clinton for not taking more concerted action against Osama Bin Laden and Al Qaeda and giving him a crummy economy to start with? Nope. Our very best Presidents have never looked back and blamed his predecessor. All of it, which is sort of hard to believe, isn't it? Well, today under President Barack Obama, it is $3.81/gal and heading towards $4.00/gallon and nary a peep out of the mainstream media anywhere as far as we can tell. Families are just as hurt in the wallet now by filling up their gas tanks with $50-$75 worth of gas every 10 days or so as they were in 2008...what is the difference between 2012 and 2008 other than the fact that we have an African-American Democratic President today versus a white Caucasian Republican President then? There must be something else going on nowadays where the same set of facts can elicit such a different reaction from people. Is it the fact that President Obama is our first African-American President in our history and people are willing to cut him some more slack than a white Caucasian President such as W? Is it that America has suddenly become a center-left nation after almost 2 centuries of being a center-right nation politically? Or is it because the news media and polling firms have become so ardently liberal and extreme in their political outlook skewing to the left (in most cases) that they selectively chose to present the same set of facts in a positive light for President Obama because he is a Democrat whereas they would have excoriated and eviscerated W for having exactly the same set of records under his watch? We think character issues are important but we think it is far more important in this crucial election to look at the executive management abilities of each candidate above basic decency issues. Leadership ability as in 'bringing people together' to get to some common-sense solutions for everyone, not just one faction or another, is a crucial component of electing a president. Having a deep understanding of how to balance budgets and how free enterprise works at the core level is essential to getting this economy growing once again so everyone who wants to work can find a job, don't you agree? We are asking people to look at the facts and make up their own decisions based on them, not what the media tells you to think or even some blogger like me. Not only for the presidential race but for the US Senate races now up for grabs in 34 states; the US House races and every race down to dogcatcher, if they still have elections for those nowadays. If you can take a look at the above list of economic statistics and honestly say in your heart of hearts that you are proud of President Obama's economic achievements and that he has America 'on the right track', then by all means, vote for him in November. If you don't think he has done a great job as our Chief Executive, you can either vote against him or for Governor Mitt Romney, take your pick. One way or another, you'll be expressing your dissatisfaction with the job performance of Barack Obama over these past 4 years. President Barack Obama now has a 4-year record just like George Bush 43, George H.W. Bush 41, Bill Clinton and every other President going back through FDR to Lincoln to George Washington himself. Hold him to the same standards you would hold any other President. It is your choice.